The University of Cincinnati's Morgens Hall, the university's grand "glass house," recently earned a 2015 American Institute of Architects (AIA) of Ohio Award –– the state’s highest prize for design. 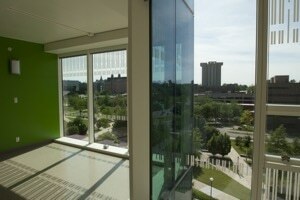 As such, the Morgens' innovative renovation, completed in 2013, advances UC's campus environment, which has been recognized in recent years as one of the world's most beautiful by Forbes magazine and others. But Morgens is about more than attention-getting style. It also incorporates sustainability and eco-friendly efficiency. According to Aaron Hill, partner at Richard Fleischmann + Partners Architects, Inc. –– the firm that designed the renovation of the building in 2013 –– Morgens Hall surpasses most new designs in areas of high sustainability and aesthetic quality. As a result Hill says Morgens Hall has, to date, been recognized with three different Design Awards from the AIA Cincinnati, AIA Cleveland and AIA for Ohio. There were about 100 projects submitted for the 2015 AIA Ohio Design Awards, with about 10 winners, Hill says. For AIA Cincinnati and AIA Cleveland, there were around 50 projects submitted for each, with Morgens Hall winning in all three categories. This successful project wasn’t always in the initial plans, however, as Morgens Hall and her soon-to-be twin sister, Scioto Hall, were originally scheduled for demolition. Part of the triplet-sister-residence halls built in 1964, Morgens stood proud on the corner of Martin Luther King Dr. and Jefferson, with Scioto Hall in the center and Sawyer Hall on the far end. But in 2000, the university’s master plan suggested the buildings be removed. Sawyer was razed in 2006, while Morgens and Scioto remained shut down until plans to demolish and all new construction could begin. But by 2008 the buildings’ foundations were assessed as sound and strong, resulting in the decision to renovate instead. The three buildings –– originally called the three sisters –– are now comprised of just the twin sisters. The other twin, Scioto Hall, is presently under reconstruction to identically match Morgens Hall and is projected to open in August. “After careful analysis of the structures the university determined the buildings could be reused,” says Mary Beth McGrew, AIA; senior associate vice president of Planning + Design + Construction, University Architect Division of Administration and Finance, P+D+C. “When considering housing options it is also important to note the nearby structures that make living and learning convenient for the students. Also aligning with President Santa J. Ono’s Third Century Initiative to increase the campus sustainable and eco-friendly efficiency, Morgens Hall rises above and beyond the average “green” structural model. It’s easy to see why AIA Design Award critics liked the state-of-the-art design features. The most notable include the building’s reflective façade, designed with an outside skin of 2,000 glass panels, each consisting of two quarter-inch thick panels with one-half inch of air space separating each pane. These layers are actually designed as energy savers to filter sunlight coming into the interior while maintaining privacy for the residents by reflecting outside solar glare during the daylight. Other interesting features on the exterior panels include the white linear pattern called fritting that looks, from the inside, like a row of drapery on top of each panel, with a thinner design below that looks similar to a chair railing. This fritting, seamlessly integrated into the window design, actually decreases the heat gain by another 20 percent –– and is also effective in warding off birds, who might otherwise collide with the glass. As for added privacy at night, the glass panels all have adjustable screens that are 98 percent opaque. Ultimately, Morgens Hall achieved LEED silver certification in 2015. LEED or Leadership in Energy and Environmental Design, is a prestigious green building certification program that recognizes best-in-class building strategies and practices. Award-winning Morgens and the nearly completed Scioto Hall each provide (or will provide) 144 apartment units that accommodate 456 beds per building.